A field of sunflowers is a spectacular sight with its huge golden flowers tracking the sun as it moves across the sky. Sunflowers produce healthy seeds, oils, and, more recently, lecithin. Now the beautiful sunflower has become even more valued for its non-GMO status, which is assured for the foreseeable future. While genetic engineers aim to produce GMO versions of many food crops, they aren’t likely to manipulate the genes of sunflowers anytime soon for two reasons. First, it is difficult to genetically alter sunflowers. According to US Department of Agriculture scientists Brent Hulke and Michael Foley, the plant is “recalcitrant to (genetic) transformation.” Second, sunflower has many wild and weedy related species, and transgenes could pass quickly to these wild varieties, which could proliferate in the environment. The non-GMO status is benefitting sunflower farmers and processors who are seeing strong demand for sunflower oil and lecithin from food companies and restaurants looking for non-GMO alternatives to GMO-risk soybean and canola oils. In a recent article in FoodNavigator, Tony Intal, a sales representative with Oilseeds International, said food manufacturers want to shift away from GMO oils and replace them with oils with heart-healthy high-oleic acid values. Sunflower oil is a combination of monounsaturated and polyunsaturated fats with low saturated fat levels. “Non-GMO and zero trans fat are big drivers for the demand for sunflower oil,” says Rick Robbins, CEO of Colorado Mills, a sunflower oil processor based in Lamar, Colorado. Christine Brown, sales and marketing manager for California-based Adams Vegetable Oils, agrees. “More and more companies are looking for non-GMO oils; demand is very high for non-GMO,” says Brown whose company’s oils are Non-GMO Project verified. 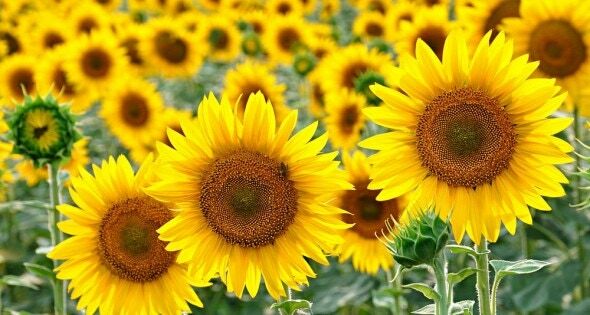 Sunflower oil is also light in taste and appearance, supplies more vitamin E than any other oil, and is non-allergenic, another advantage over soybean oil. Oil is the major product of the sunflower crop, which is grown on nearly two million acres each year in the US. The leading sunflower producing states are South and North Dakota. Organic sunflowers are grown on about 18,000 acres. According to Sandbakken, sunflower production in the US increased eight percent this year and 39 percent in North Dakota. “As demand has increased for the oil, we’d like to see long-term growth. We want to build the market and keep the supply steady,” he says. Walmart became a big driver of the demand for sunflower oil when it launched bottled oil last year. Restaurants, particularly Chipotle Mexican Grill, are also pushing demand. Chipotle, which has committed to removing GM ingredients in foods served in its restaurants, has been replacing GM-risk soybean oil with non-GMO sunflower oil. Sunflower oil can cost nearly twice as much as soybean oil. But Robbins emphasizes that sunflower is a more efficient cooking oil, citing an example of a potato chip manufacturer who produces twice as many chips using the same amount of sunflower oil as he did with soybean oil. Colorado Mills produces sunflower oil using an expeller pressed process instead of an extraction process involving a hexane chemical solvent that is used by larger sunflower oil processors such as ADM and Cargill. This “natural pressed” process is preferred by organic and natural food companies. Both Colorado Mills and Adams Vegetable Oils also sell organic sunflower oil. “The demand for organic oils in the US is very strong,” Brown says. Another sunflower byproduct, lecithin, is also seeing growing demand among food manufacturers for the past few years, Sandbakken says. “Companies that want to go non-GMO or want to avoid allergens are looking at sunflower lecithin,” he says. Lecithin is an emulsifier that helps make food ingredients, such as water and oil, blend together. It has traditionally been derived from soybean oil, but due to GMO concerns more food manufacturers are favoring sunflower lecithin. Its non-GMO and non-allergenic status led both Austrade and LECICO to introduce sunflower lecithin. “The market was looking for non-GMO and organic alternatives to conventional GMO and solvent-extracted lecithin,” says Gary Bartl, president of Austrade. Demand is strong for sunflower lecithin with sales growing by 10 to 20 percent per year, says Andrea Wolters, LECICO’s managing director. Bartl also reports strong demand. Sunflower lecithin costs more than soy lecithin. “Sunflower lecithin is slightly more expensive because there is less capacity worldwide and less yield than soybeans,” Wolters says. “Mother nature as well as supply and demand determines the price,” Bartl says. There is also less lecithin in sunflowers than in soybeans, and it is more difficult to extract, Sandbakken says. Bartl and Wolters both report good supplies of sunflower lecithin. Organic sunflower lecithin is also available but can cost 10 times as much as conventional, non-GMO lecithin, according to Wolters.